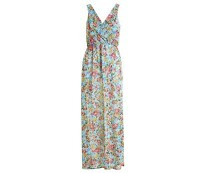 This pretty maxi dress is a great choice for a summer evening. Featuring a light stretch fabric, this design offers statement style with comfort. 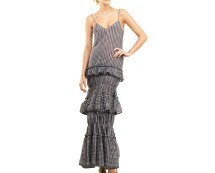 Team this dress with wedge heels and studded accessories for ultimate edgy style! During summer, wear it as it is with some strappy sandals for comfy stylish daywear! Heading off on an early spring holiday soon?! Grab yourself this beautiful floral maxi… Perfect for beach and pool days over a bikini or team with a waist belt and glam earrings on a summer holiday night out!